Gary W. Cain, 81, of East Springfield, OH, passed away peacefully on Feb. 4, 2019, at Trinity West Hospital in Steubenville. He was born Oct. 17, 1937, at his home in East Springfield to the late Wendell and Audrey Cain. He is survived by his wife of 61 years, Margaret (Edwards) Cain who he married on Sept. 15, 1957, a son Brad L. (Tammy) Cain and son-in-law Joe DeBold, all of East Springfield; five grandchildren, Allison (Scott) Pickett, Devin (Chad) Litten, Taylor (Emily) Cain, Eric DeBold, and Shaylyn Cain (Gabe McCarthy); and two great-grandchildren, Grayson and Madison Pickett. 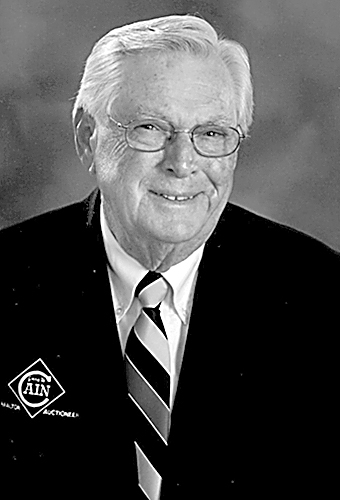 Throughout his career he served as President of the Steubenville Board of Realtors; Ohio Association of Realtors District 2 Vice President and led several committees; and President of the Ohio Auctioneers Association in 1975. His success in business led him to be the recipient of many prestigious honors, including Realtor of the Year for the Steubenville Board of Realtors multiples times; Distinguished Service Award for the Ohio Association of Realtors; inducted into the Ohio Auctioneers Hall of Fame in 1993; Jefferson County Chamber of Commerce Businessperson of the Year 2008 and Lifetime Achievement Award recipient 2015; and inducted into the East Central Association of Realtors Hall of Fame in 2018. He was a lifetime member of the Christ United Methodist Church in East Springfield and held many offices in both his local church and in the Eastern Ohio Methodist Conference. In addition to faith and family, he was an avid hunter who traveled the world including taking two safari trips to Africa. He had a love of all animals but especially enjoyed riding his horse, Knight. He was always looking for the next adventure which included going skydiving on his 70th birthday. The funeral will be held at the Christ United Methodist Church in East Springfield at 11 a.m. on Friday, Feb. 8, 2019, with the Rev. Greg Bush officiating. Burial will follow at the East Springfield Cemetery. Visitation will be at Dodd’s Funeral Home in Amsterdam on Thursday, Feb. 7, 2019 from 4-8 p.m. and on Friday from 10-11 a.m. at the East Springfield United Methodist Church. In lieu of flowers, donations may be made in his memory to the Christ United Methodist Church, P.O. Box 127, East Springfield, OH 43925.